....Is what we have taken from the sale of Trail Guides over this weekend. We have sold out of booklets, but I shall be at the printer's first thing in the morning to order another batch. Thank you to everyone who has supported our trail and our church, by joining in our Scarecrow Trail, either by building a 'crow' or by visiting the trail over the weekend. The trail remains open throughout this week, and on Saturday 11th July until 5.00 p.m. On Saturday evening, we celebrate the close of another successful trail with a 'bring and share' Scarecrows' Supper. Five tickets are left for this. The cost of an adult's ticket is £5.00. Children come free. 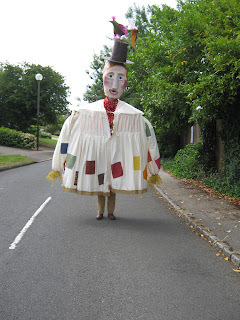 The Loughton Giant will walk next Saturday at 11.00 a.m. and 2.00 p.m. If you want to see him and have a selfie opportunity, be at the church on time!